unusual galaxy NGC 660, relating to a rare class of polar galaxies. The galaxy NGC 660 is located at a distance of 40 million light years from Earth near the constellation Pisces. It is as if two separate star clusters: the spiral and lenticular. Such galaxies are called polar – they rotate the outer ring over the poles of the internal cluster. In addition, NGC 660 is the only other known polar galaxies in which the center has an old lenticular congestion. All polar galaxies are a result of the interaction of two separate star clusters. Some of them can be formed by the collision of two galaxies formed (for example, a galaxy can be formed by a merger in the future, with the Milky Way Andromeda). Others are the result of close gravitational interaction clusters. Astronomers do not yet know how NGC 660 unusual structure formed , but are inclined to the gravitational interaction version. 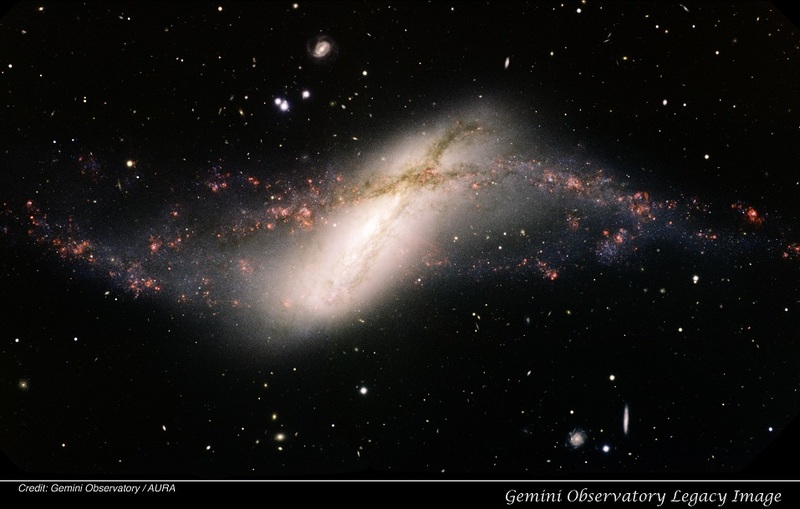 Against the hypothesis of a collision, in particular, by the absence of the center of NGC 660 in the two supermassive black holes. Instead, astronomers have found in the center of the galaxy powerful radio emission coming from the young blue stars. Their formation was stimulated by the gravitational interaction of two proto-galaxies.